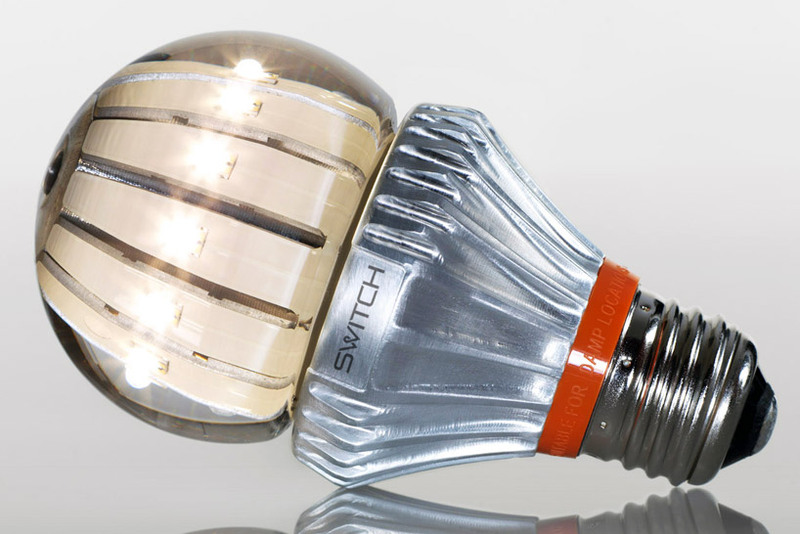 On exhibition at CES , ‘switch‘ liquid cooled lightbulbs combine analog and digital technology to offer a new lighting solution, providing the same quality of light as ordinary incandescents but with highly increased energy efficiency and recyclability. A digital driver in the base of the bulb provides electricity to ten LED lights mounted in the glass globe and continually monitors the bulb’s temperature. fluid inside the globe draws heat away from the LEDs, thus cooling them and using instead the entire surface of the bulb to dispense heat. the metal curves of the bulb’s base likewise serve to increase surface area and assist in cooling the result is a light bulb 80% more energy efficient that conventional incandescents but which does not contain any mercury, as do many compact fluorescents. the 100-watt bulb, for example, utilizes only 19 watts of energy to produce a lumen output of 1600 in netural white light. Currently produced to mimic 100 (green), 75 (blue), 60 (orange), and 40 (purple) -watt models with clear or frosted glass, ‘switch’ lightbulbs fit any ordinary socket last for about 25,000 hours each (compared to 1,000 for incandescents). the warm light of the bulbs has a radial flux nearly identical to that of incandescents, offering the same kind of far-reaching light and gradual shading. Currently bulbs are available in 120 volts but the company plans during 2012 to create a 240 volt version for europe, japan, and other parts of the world. ‘switch’ lighting is designed under the ‘cradle to cradle’ philosophy, so all components are reusable or recyclable. currently shipping to select destinations for beta testing, the bulbs are expected to be publicly available within the next year.